After my latest reading project, I just might be able to poison someone and get away with it. 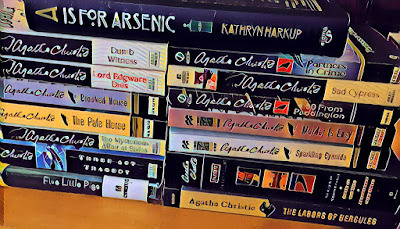 I started by picking up Kathryn Harkup's A is for Arsenic: The Poisons of Agatha Christie. I soon noticed that each of the fourteen chapters was based on a specific Christie book or short story collection and, because I wanted comfort reads this season, this project quickly formed in my head -- read or reread a classic mystery before each chapter of non-fiction. It turned out to be a wonderful idea. I loved reading the novel or stories and then delving into why the poison of choice was used and if Christie made any errors, the science of what it is and how it kills, how/if it would have been detected at the time, and some real life poisoning cases/influences. I loved the science, the history, and, yes, the Poirot (and Marple, Tommy and Tuppence, Ariadne Oliver, and even Mr. Satterthwaite). I was shocked as I reached book ten or eleven and found that I wasn't at all tired of Dame Agatha's stories. Each one was unique, with a wide variety of settings, characters, and even points of view. I want to point out too that Harkup's book has the most amazing appendix -- a list of every Agatha Christie story and how all of the people die in them! I still have a few Agatha books that I haven't read (I own 66 of her books, not counting her autobiography and her travelogues) but when I'm done, I'll really dive into that appendix. The only person that wasn't exactly happy with this project was my husband. Apparently, having your wife learn the ins and outs of 14 deadly poisons and then recount all of the gruesome details in bed each night for weeks isn't fun. All I know is that I've already made the mistake of saying too much. Thallium is my favorite. Did she get that one right? Talk about the perfect poison. Yes, she did! It was in The Pale Horse and the victims had the correct range of misdiagnosed causes of death. 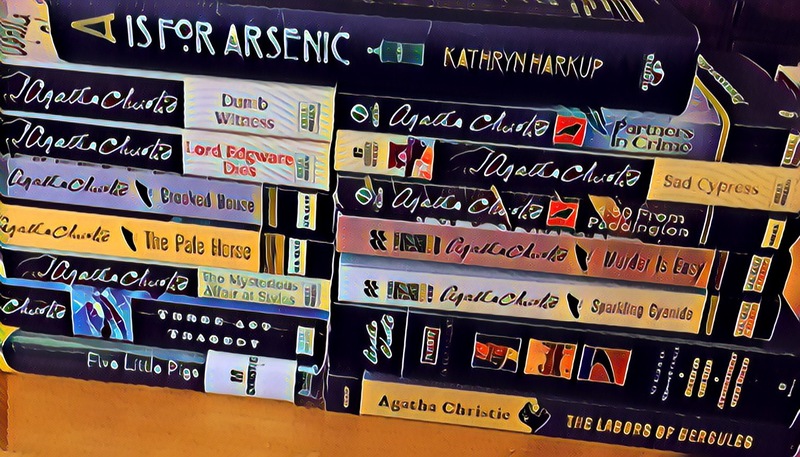 I've read A is for Arsenic, but it never occurred to be to read the books in conjunction with it. What a clever idea. An Agatha binge was so much fun! What a marvelous reading project. I really enjoy books like A is for Arsenic, and much as I like Christie, there are quite a few titles on your list that I haven't read. I am also trying to make this season's reading more along the comfort vein than the scare-my-socks off approach. Comfort was definitely a perfect way to go this year. I also thought it was going to be strange to go into each book knowing someone was going to be poisoned. I thought it might take the fun out of the stories but it really didn't! Christie really was a master of the genre.